A couple of weeks ago I bought some frozen bread dough to try a couple of recipes. Yesterday I took it out to thaw, but it was too late to use for dinner. At 11 pm I realized I needed to do something with it. So I scoured the Internet (and, of course Pinterest) for ideas. I settled on cinnamon rolls. It would be perfect. I'd get up a little early and feed my family homemade cinnamon rolls. Well, I'm determined to share my successes, as well as my failures, as I take this journey to learn to cook. Today's experience falls somewhere in the middle. 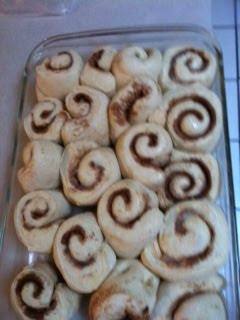 The rolling the dough and doing the butter, cinnamon and sugar was easy. Even cutting and putting into a pan went smoothly. I covered them and put them in the fridge to rise over night. If you are a baker, you probably noticed the problem: too many rolls--too close together. 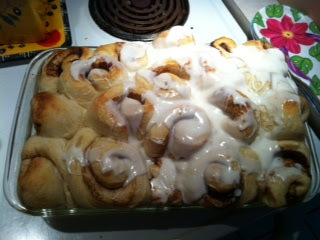 After baking about 20 minutes, they looked (and sounded--tap, tap) perfect. I covered them in homemade glaze (did you know the glaze is just powdered sugar and milk?!?!). I did intentionally leave that left side unfrosted. 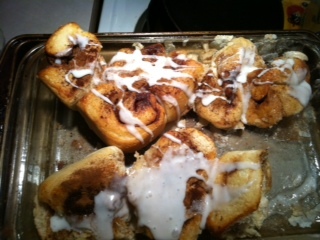 They may not look as pretty as Cinnabons, but they tasted good.